The lower house of the French parliament has strongly backed a tough new anti-terrorism bill enabling greater use of video surveillance. The bill would allow potential targets, including places of worship, to install cameras and police to hold terror suspects for up to six days, from four. The new measures still require approval from the Senate to become law. The interior minister has headed efforts to bolster anti-terror laws in response to the July attacks in London. 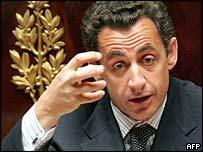 Nicolas Sarkozy told deputies that the bill was designed to give France "a more efficient arsenal" and to "give greater powers to law enforcement to avoid a catastrophe". The BBC's Caroline Wyatt in Paris says the French authorities were impressed with the use of video footage in identifying the London bombers. The new bill would allow potential targets - including public transport, places of worship and shops - to install surveillance cameras for the first time. Thanks to strict privacy laws, there are just 60,000 video cameras in public places in France, compared with more than four million in Britain, our correspondent reports. The provisions will oblige internet providers and internet cafes to store and make available to police their customers' connection records. The new law should also enable the French police to monitor those who travel to countries known to harbour terrorist training camps. A member of the Green opposition party has expressed concerns about the implications for civil liberties. The Senate - or upper house - will examine the measures in December before the new law is adopted by the end of the year. Correspondents says the move is the latest example of how European countries are tightening their anti-terrorism laws.